City Councillors vote in the majority for parking meters. Although Smart City Solutions (SCS) has agreed to reduce the parking meter fees and the life of the contract from 49 to 20 years, a divided Georgetown’s City Council ended a meeting Wednesday with a decision to hold further negotiations with the company based on the deliberations. The proposed amendments would see the parking rate being reduced from GYD$125 per every 15 minutes or GYD$500 per hour to GYD$50 every 15 minutes or GYD$200 per hour. The company has also agreed to tentatively remove parking fines of up to GYD$10,000 to allow for revision. The booting (locked wheel) fee of between GYD$20,000 and GYD$30,000 would be slashed to GYD$8,000 and the towing fee would be reduced from between GYD$30,000 and GYD$60,000 to between GYD$12,000 and GYD$20,000 and the storage fee decreased from GYD$10,000 to GYD$7,000, if the council agrees. Mayor Patricia Chase-Green explained that parking meters would be installed in a selected area of the city as part of a pilot project so that the company would decide whether after a given period to continue the revenue generating service. The company has to seek Council’s approval before expanding into other areas. The three councillors abstaining on whether to support the introduction of a parking meter system in Georgetown. Left to right: Deputy Mayor, Sherod Duncan of the AFC, Lionel Jaikarran of the AFC and the PPPC’s Bisham Kuppen. Before the end of the more than three-hour meeting, Councillors voted on whether they support the introduction of a parking meter system in Georgetown: 17 for and three abstentions. Seven councillors were absent and two others have already resigned. Those abstaining were Deputy Mayor, Sherod Duncan of the Alliance For Change (AFC) , party colleague, Lionel Jaikarran and the People’s Progressive Party Civic’s Bisham Kuppen. Chairman of the Finance Committee, Oscar Clarke disagreed with the People’s Progressive Party Civic’s Bisham Kuppen that the contract should be reviewed after three local government election cycles- that is nine years- instead of 20 years. Clarke said the company must be provided enough time to recover its US$10 million investment. “Nine years is too short. It’s not going to be able to recoup it in nine years. The reason we went for two jumps- the first ten and the next ten and then have the increments- is because we recognise that we are getting off the top from the beginning…From the time the operations begin we begin to get money,” said Clarke. Kuppen’s recommendation that there be a 45 percent take from the gross earnings instead of the proposed 20 percent of gross parking and enforcement revenue was rubbished by Clarke. The proposed amendment allows for 20 percent gross takings for the first nine years, 25 percent for the next 10 years and 30 percent for 20 years and more, instead of the original offer of 20 percent of gross parking and enforcement revenue for the next 49 years, 10 percent gross garaged parking revenue and 10 percent of net value added services revenue. Several councillors continued to express concern about being asked to agree to the recommended amendments to the contract without seeing the actual deal. 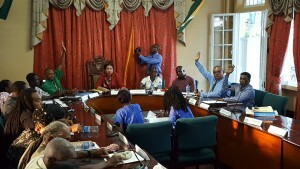 City Mayor Chase-Green repeatedly admonished councillors for failing to take up the offer to visit the Town Clerk or her office to read the contract. Jaikarran said he did not recall agreeing to contract with SCS and questioned why wasn’t the company at the council presenting its case instead of councillors. “I cannot support the implementation of the parking meter system,” he said, because of a lack of tendering, little or no feasibility study, lack of consultation with the general public and the private sector. Insisting that he would not support the imposition of the draconian parking meter system on Georgetown’s long-suffering citizens, Jaikarran called for the project to be tendered. Councillor Ron Persaud, who is from the APNU, called for the contract with SCS to be scrapped altogether and make way for the City Council to put in place its own system of paid parking. “My constituents are not for it, I am not for it,” he said. “I do not care what kind of clause to get out of this contract. Either we renegotiate it and we open it to be tendered, we open it and we know what is the best deal that the city should get,” he said. He flayed the Town Clerk and the Mayor for keeping a public document away from the elected officials. He recommended that City Hall gets 80 percent gross earnings and that the investor pays all legal fees arising out of any lawsuit. He queried whether City Hall would be allowed to audit the earnings and ensure that the municipality gets all the revenue from core and value added services. Persaud also suggested that there should be public bidding for lands that are required for the parking meter system. 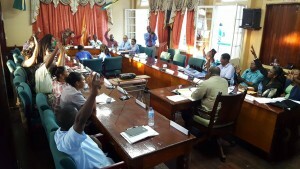 Cautioning against the grave likelihood that Traffic Wardens, who would be employed by City Hall and paid by SCS would not have their income tax and social security remitted to the Guyana Revenue Authority and the National Insurance Scheme (NIS), Persaud recommended that the investor be charged. “Once we have them under our employ, then there should be an admin fee that we charged…when they (constables) don’t come and we might have to send our own employees, hence the bill comes to us so we have to make that pellucid clear that we are not going to pay on anything and anything we may must be reimbursed,” he said. Clarke told the council that the contract is the best deal that the cash-strapped municipality could get. “Voting against the project means that we will be voting against an opportunity which this council has never had before and which it is hoping to get now….If we allow this opportunity to slip we are going to be losing out on one of the best opportunities to finance this council ever,” said Clarke who has been a councillor for the past 17 years. He agreed with Councillor Persaud that there was need for a clause in the agreement to insulate City Hall from damage to any vehicles. Clarke did not favour the suggestion by one councillor that latest amendments be sent back to the President of Guyana, David Granger for approval. Among the issues and concerns that were raised by Councillors that would be addressed by City Hall’s negotiators and SCS representatives- the Town Clerk, Chairman of the Finance Committee and the Mayor- are parking for the disabled, parking by residents who live aback stores on Regent Street, and parking for minibuses and hire cares. Clarke assured that arrangements would be made for residents and disabled persons to park in certain areas.